I am so disappointed that Cafe Vienna Sugar Free has been discontinued. I have been drinking it for years and personally used at least 100 cans per year. I do not like vanilla or chocolate in my coffee. Thank you for visiting http://www.kraft.com/ and for your interest in MAXWELL HOUSE International Sugar Free Cafe Vienna. It's great to hear from consumers who are looking for our products because it lets us know how much you enjoy them. The tough part comes when we have to share the news that the product you're trying to find has been discontinued. If products don't seem to be popular with our consumers, and demand starts to drop, a decision is made to discontinue the item. Once this decision is made, we stop making the product and the remaining supply is shipped from our warehouse to the grocery stores. At this time there are no plans to bring back our discontinued products, but we are always cooking up something new to help you live and eat better so you may discover a new favorite! Again, thanks for contacting us, and I hope you'll continue to enjoy our products. I recommend you to visit http://www.rusheessays.net/. It's the only resource, where you can easily get great, fast and well written work. Would like that your study was fine and simple? Click and pass to rushanessay services! Now you won't need to strain! You have a great niche site! I would like to place some ads on your site, is it possible? My site is essaymaxi I think your blog is an ideal place for advertising. And by the way, the moderators of this forum should change the name of this thread to reflect the fact that the coffee is no longer marketed under the old General Foods International name. Why would they discontinue Cafe Vienna.....I cannot find it anywhere. It was always a big seller and I must have it every morning, LOL. Can anyone tell me why ??? Kraft - Bring it Back! Wow! I thought I was the only one addicted to GFIntl Coffe Sugar Free caffeine free Cafe Vienna! I cannot believe they stopped making it and am having a very hard time coping. I hope they realize how popular it is and bring it back! We have public outcry! Like everyone else, I'm so disappointed that GF is no longer producing Cafe Vienna sugar free coffee. i actually like the sugar-free decaf version but would gladly let that go if they would just produce the SF version again. Everytime i go to Wal-Mart I look at the shelf and when it's not there I feel like a little kid looking into a toyshop window at a toy they wanted that disappeared. What an incredibly stupid decision - my Walmart could barely keep this product on its shelves. let's hope someone with a brain at Kraft reads these messages. Have you tried the S/F Suiss Mocha? It's real good...but it is chocolatey! I am also a diabetic and need sugar free. My favorite is the Cafe Vienna Sugar Free which I am finally realizing is no longer offered by your company. Sorry for that because I use to purchase a great deal of this coffee and now am unable to drink any of your coffees. Would be nice if you offered the sugar free again. I've been using this product for about 3 years. I love it. I am diabetic so I can't use the sugared versions. But for the past 4 weeks I have not been able to find the sugar free Vienna Coffee on the Grocery shelf. Not International, or Hills Bros. or Private Selection (Kroger Brand. Something is going on! Do you think something is wrong with these products and they HAD to be removed from the Grocery shelves? Very disappointed. OMGoodness - you are right about the carbs! The carb count is much higher in the Hills Bros. I recently got the yen to try the Cafe Vienna in sugar-free...been everywhere looking for it. Now through this site I find out that it's discontinued! Boy --- what a disappointment!!! In reading through these comments; I'm not sure this is really coming back. I'm hugely disappointed Kraft has discontinued the sugar free variety. HOWEVER, I have found an alternative that is closest to the flavor to me..OUTSIDE of the Kraft family I hope! It's Hills Bros. sugar free French Vanilla Cappuccino in a little bit taller red rectangular plastic box. I can only find it at Wal-Mart locally. I'd be interested in anyone elses comments regarding alternatives they have found. I have been drinking the s/f Cafe' Vienna for over 20 years and sorely miss it!!!!!! Like again reader, I am not interested in the sugar nor chocolate in my drink! WHERE'S THE SUGAR FREE CAFE VIENNA? WE ARE IN AN AGE WHERE NUTRION IS MAKING AN EXTREME IMPACT IN THIS WORLD. ADVERTISEMENTS ON TV EMPHASIZE THE USE OF LOW SODIUM AND SUGARS. RESTAURANTS FOR HEAVEN SAKES HAVE JUMPED ON THE BAND WAGON AND HAVE ADDED LOW DIET ENTREES TO THEIR MENU AND EVEN MCDONALDS HAS JUMPED ON THE BAND WAGON. FOR THIS COMPANY TO TOTALLY DO AWAY WITH THIS PARTICULAR ITEM IS UNACCEPTABLE. I HAVE GONE FROM STORE TO STORE CHASING THIS SUGAR FREE CAFE VIENNA AND WOULD BUY UP WHAT THEY HAD IN STOCK. CAN NOT FIND THIS AT ALL. wHAT IS THE PROBLEM? AS A CONSUMER, I PAY YOUR ASKING PRICE. IT IS NOT A PRODUCT THAT SITS ON THE SHELF INDEFINALTELY! NOW ALL I CAN FIND IS VERY FEW OTHER SUGAR FREE COFFEE THAT I REFUSE TO TRY! CONTINUE TO KEEP YOUR CONSUMERS HAPPY AND CONTINUE TO OFFER THIS PRODUCT. OBVIOUSLY, THIS COMPANY DOES NOT GIVE A HOOT! just spoke with spokesperson -definetly discontinued...not happy! I too am so upset that I cannot find Sugar Free Cafe Vienna. What happened? Why has it been discontinued? I do the same thing, Kelly! I add a heaping teaspoon to my AeroPressed coffee. Maybe Maxwell House should come out with a carton of Vienna Cafe powder that contains everything but the instant coffee. I would buy it.....IF it's sugar-free. I realized my favorite coffee beverage was disappearing a few months ago and bought up all I could find. I am now on my last can. I am diabetic and have an actual NEED for the product! (Seems diabetics are 2nd class citizens anyway.) Also, it's the only flavor I really like. I have always used it as a sort of "creamer" for my brewed coffee rather than just adding water to the mix and drinking it as a "stand-alone" beverage... it goes further that way. I have recently bought a little bottle of cinnamon extract and have tried adding about 2 or 3 drops to my creamed and Splenda'ed coffee. It's not the same as the original product, but it ain't half bad. Here's hoping they revive this great classic! I have scoured the shelves of manym many stores in the Columbus, Ohio area and cannot find any cans of the old or "supposed" new sugar free Coffe Vienna. I am totally addicted to this drink. My mornings have not been the same since I ran out. As a diabetic I really need the sugar free version. In fact I tried the regular version and it did not taste the same or as good as the sugar fee did. Please keep all of us posted in case you see it! I was on Amazon's automatic shipping for this product. I was receiving 6 cans a month and had just updated to 12 cans a month when Amazon notified me that it was no longer available. I called Maxwell House over a month ago about this and was told they may bring it back in a new form. Why mess with success? I did see somewhere that the amount in each can would be 2 ounces less for the same price or higher. I could not find that website again BRING BACK MY COFFEE PLEASE. There is nothing else that comes close to the satisfaction of my first cup every morning of CAFE VIENNA. On Amazon right now it is available for more than double the price and even I won't buy that at that price. I have just savored my last can. I need my SF Cafe Vienna! by: Disappointed in No CA! I have also been a purchaser of this particular flavor of GFI and I have now run out.. I bought every can I could find not just in my local markets but 5 hours away when I went to visit my daughter! I am so unhappy that I cannot find it in any stores anymore! AND doubly unhapy that when I emailed the company, I talked to a 'lovely' rep who said "well, if you can't find it in the stores anymore, we must have discontinued it" ... how dumb can a rep be? they don't even KNOW IF the company is making it anymore? too weird! I am hoping against hope that it will be back on the shelves soon ... nothing tastes as good! I'm so upset,at not being able to get S. F. Cafe Vienna. I'm diabetic and this is the one drink that I love. Can't have chocolate or coffee so this was an answer to a prayer for me. I hope and pray that those responsible for stopping the production of this great drink will reconsider their decision. Thanks for keeping us updated Sue!!! I'll have to give them a call to see if there is anything in my area at all. But at least all hope is not lost from the things you've heard. I'll keep my fingers crossed that the production starts up again soon and we'll be seeing it on the shelves!!! I still have a few cans left, but it's dwindling very quickly!! The Albertsons grocery manager was unable to order the product. He says if it indeed is available again, it may take a year for it to get back into their ordering regimen. I called GFI (which is now Maxwell House, a division of Kraft Brands; is there anything Kraft doesn't own?) customer service again (800-432-6333) and spoke to Laurie. She reiterated that the sugar free Cafe Vienna is back in production and should be available at Albertsons, Stater Bros, and Vons (she also said to keep checking on Amazon and confirmed it is NOT available from their online retailer netgrocer.com). I told her of my Albertsons experience and asked for specific locations where I could find the product. The three locations she referred me to were each about 15 to 20 miles away. One was a Vons near my husband's office. I arranged for them to hold three cans, and my husband purchased them ($4.49 each). So now I have a good supply of the sugar-free Cafe Vienna. That's the good news, for me anyway. The bad news is that I don't think this is the back-in-production SF Cafe Vienna -- I suspect the cans I got yesterday are just old stock. The design on the cans is exactly like the can I saved from several months ago, before the product began disappearing. So this doesn't really prove anything. If the reinstated product ever appears on shelves, I think it will have the new can design -- the Maxwell House design. That is great news Sue! Please let us know if you eventually find it for purchase. This gives me a little bit of hope. Those stores aren't in my area, but my mom has them where she lives. Thanks again! Confirmed again: SF is back! Just got off the phone with customer service. She absolutely confirmed Sugar Free Cafe Vienna is being produced. She said it was discontinued briefly and is now available again. Vons, Albertsons, and Stater Bros in my area are supposed to be able to get it. The UPC is 043000000106. My local Albertsons grocery manager told me yesterday that they are unable to order it. I'll have to speak to him again. If anyone can find it on the GFI website, it would be helpful to have an image of the newly designed can to show grocery managers. This was more than just an enjoyable beverage to me. About a month ago I saw SF Cafe Vienna on the shelves at Publix with a clearance tag. I purchased every one. The next week the shelf was restocked. I asked the sales manager what was the story, and he said it sold out, so we got more. I went to local Publix yesterday and it was gone. There was not even a space for it. I went to a second and then a third Publixs. It was not available at any of them. Then I tried Super Target and Winn Dixie, to no avail. At that point I knew something was up, so I went seaching online and have discovered this upsetting news. This was more than just an enjoyable beverage to me. Some of the defining moments of my life have been contemplated and seen through with a cup of SF Cafe Vienna in hand. Perhaps it is time to move on, but I hope not. It was a simple way to endulge, without undoing all my efforts to stay fit. San Diego Sue -- please let us know if you are eventually able to find it at your local stores. I would be so happy to find out they're still going to produce it. I only have a few cans left and then no more.....Thanks for calling them. When I called 800-432-6333 a month ago, I was told by the GFC customer service rep that the sugar-free Cafe Vienna had been discontinued. Today, October 14, 2010, the rep at that same phone number told me the product was still being produced and had been ordered within the last 30 days by my local Albertson's and Stater Bros markets. I made it very clear I was looking for the sugar-free variety, and the rep reiterated it was still available. As recently as yesterday, it was not on the shelf at Albertson's. I plan to ask the grocery manager about it. out there who feel as I do about this particular coffee. I have been drinking it since the '80s. I am hoping the company will reconsider this misguided decision. I felt that I single handedly could keep the product on the shelf in my area, just from the amount I bought each week! I was able purchase some cans (around $200 worth) from a link through the company's website. I believe it took me to NETGROCERS.com. When I called, they said that was the way to get hard to find products so, that may be helpful to all of you who are as addicted to this coffee as I am. Thanks Kathleen -- I'll definitely be calling and hope they bring it back!!! Call 1-800-432-6333, and speak with the representative and tell them your disappointment that cafe vienna sugar free has been discontinued. The representative told me that they indeed discontinued the product, but that they listen to their consumers and if we continue to call, that might make a difference. She said it may even come back with another name and different packaging. She said they shipped out their entire stock, and nothing available to ship out. She even checked my area code and there was not any SF cafe vienna in a 100 mile radius. I am boycotting all Maxwell House Coffees and General Foods International. You people must be idiots discontinuing a top seller, not to mention trying to compete with Starbucks and McDonalds. I hope you will reconsider this stupid decision and fire those that made the recommendation. I have been drinking this coffee for 10 years!! I'm SO upset about the discontinuation. I have e-mailed Kraft, but I am seriously considering sending a message every day. I cannot believe they are doing this the new flavors are NOT the same!! I am downright distraught over the discontinuation of this product. What are you people up there thinking? You STILL need a flavor that is chocolatey!!!!!!!!!!!!!!!!!!!!!!!!!!! Now I know why I can't find sugar free Cafe Vienna! I am very confused as to why Maxwell House/General Foods has discontinued this favorite with so many diabetics out there. It doesn't make sense. I have been drinking Cafe Vienna for so many years I don't even know how long it's been. I started drinking regular CV and progressed to sugar free CV. I really hate the other flavors and wonder who drinks those! If you want to discontinue something try one of the other flavors but please don't take away our sugar free Cafe Vienna! It looks like the regular cafe vienna will also disappear. I've been drinking it since 1976, in my second year of law school. About.com has a recipe that might work. You folks crack me up, and sound EXACTLY how I feel... I have been drinking the Viennese Choco Cafe for well over 25 years, also consuming about 100 cans per yeat... how can such a large, well established company just discontinue these flavors??? We have to change their mind! Let's start a letter writing, phone call and email campaign to bring back the SF Cafe Vienna! I WOULD LOVE TO START UP A NEW BUSINESS---CALLED---SUGAR FREE CAFE VIENNA--THAT IS ALL I WOULD SELL! I HAVE ALSO BEEN DRINKING AT LEAST 2 CANS A WEEK FOR THE LAST 20+ YEARS AND HAVE TURNED SEVERAL OF MY FRIENDS ON TO IT! HOPEFULLY THEY WILL BRING IT BACK!!! SOON!!! I've driven miles looking for this! I've tried all of the other sugar free varieties, and they don't even compare. Cafe Vienna is just right and not too sweet. I go through 2 cans a week! Did they discontinue it because it's so addictive. I'm definitly addicted. I need my sugar free Cafe Vienna! I've not been able to find my coffee of choice (Cafe Vienna sugar free) for a week or so. I've been drinking it since it was introduced and the regular version since I was 16 (I'm pushing 50). I will be really upset if this is the truth and the coffee is being or is discontinued. I've got half a can and no replacement in sight! Cafe Vienna is my personal version of cigarettes/alcohol/Prozac. I need to "celebrate" the moments of my life with a thrice daily jolt. Any suggestions? I will be boycotting Kraft (something I have never done). Just like you all - very disappointed. Info - Kraft Foods has taken over from General Foods - the phone 800-323-0768 is a good one for Kraft They are pleased to get comments and if they get enough they will consider bringing it back (so they said)so let's all keep calling. I called and registered a complaint. If enough people do, they might reconsider because they do reevaluate their decisions sometimes. Remember "new coke"? Well, they brought the old back. I also emailed, figured it can't hurt to bombard them. Keep trying, people. This was such a stupid decision. I am DEVASTATED to say the least. PLEASE reconsider!! Give us one last chance to stock up. I am unable to find a halfway decent substitute. I like most of you have been drinking Sugar Free Cafe Vienna for years. I was devastated to hear they are taking it off the market. It got so bad that I couldn't find it in Virginia anymore and had to have my mother buy it by the case for me down in Florida. Now that connection is gone too - I can't find it anywhere :-( Have no idea what I'll do -- that is my morning fix! I sure hope they reconsider -- I don't like the full sugar kind! My wife and I have been using this product for over 12 years and have grown to enjoy it. I am saddly disappointed in General Foods for taking it off the market. Great product, great taste, easy to make... I would think that such a product would easily be maintained on the market. I suppose the CEO's figure differently... lets see if taking in less cash will change their minds... of course, they will still get their bonus. Can't Bear to Hear the News! Add me to the list! I can't bear to think of life without it! It's been my special treat 2-3x per day for years. I'm going to let Kraft know how upset I am over its discontinuance, too. I can't find anything that comes remotely close to a replacement. I also agree - I'm just SO disappointed that GF has discontinued Sugar Free Cafe Vienna!! I'm going to their site and let them know!!! I am VERY disappointed that Sugar Free Cafe Vienna has been discontinued!! It is the only coffee I drink and I have used, first regular Cafe Vienna and then Sugar Free Cafe Vienna for over 30 years!!! I was told by General Foods that Maxwell House has bought out the coffee line and are "in transition" right now. They will decide which flavors will be made based on popularity. I am hoping that they will resume making Sugar Free Cafe Vienna...I am going to their website and comment...hope others will, too. In the mean time, I am buying all I can find! I have been to 6 different grocery stores that stocked the sugar free cafe vienna, and have been unable to find it. We have been drinking it 3 times a day for 15 years!! It is the best sugar free treat. Sugar free French vanilla is our next alternative, but just doesn't have the unique flavor that Vienna did. Shame on Maxwell House!! Go to the website for Maxwell House or Kraft foods and complain. I told them that after being a loyal customer for all these years, that I am now boycotting Maxwell House and whenever possible, Kraft Foods. You have to fight back somehow. I have drank this and only this coffee ever since it came out. It was my "fix" 3 times a day. As a diabetic, it kept me from eating sweets and was a great stress relief. If things were going bad, just made myself a cup and the world was better. Why would Maxell House do this? As I can read, it has a great many fans. I am on my last tin. Ihad stocked up earlier this year, so that fact that it was discontinued just hit me today when I went to five stores and none of them had it. I guess I am off coffee now. I don't like any of the other SF flavors. I won't buy Maxwell House coffee anymore either. I just ran out of stock suger free cafe vienna and it is not available. General Foods makes yet another mistake. It seems like they have no heart for the diabetics out here. Why discontinue an item with so much following? If it doesn't have enough movement in regular grocery warehouses, why not put it specialty warehouse that don't require as much movement? I just went to place my every 2 month order for my "fix" of Sugar Free Cafe Vienna and was told, what you all know by now, that it has been discontinued. I have been drinking this for 7 or 8 years. I tried the 800 number posted but it did not go through. Has anyone else found any stock of it anywhere? General Foods...how can we get this back in production? My wife is diabetic and this is the only coffee she likes. I can't believe that Maxwell House and or General Foods would discontinue this flavor. This is the best flavor ever made. We all need help. No More Sugar Free Cafe Vienna??? Thanks for the 800 number. I'll call. It's my favorite of all the sugar free flavors, and I just won't drink the sugar varieties. Soooooooooo sad the company would remove from the grocery shelves an item that has proved itself over the years. I use to order it by the case! Hopefully, it will be brought back!!! 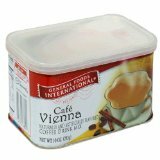 I just read if we all who want to bring back Cafe Vienna Sugar-free coffee or any others you love you need to call 1-800-323-0768, General Foods/Maxwell House (now). I have been drinking it for 25 yrs and I definately will do my best to bring it back. Good luck to everyone who loves it!! for discontinuing Sugar Free Cafe Vienna! I drink at least 3 cans a week and have been praying that it would one day come in a larger container. NOW IT"S KILLED!!! It's my only respite every day. I don't drink liquor. I don't smoke. I work, pay my bill, take care of grandchildren and enjoy at least 2-3 cups a day of Cafe Vienna Sugar Free! THIS IS SO FRUSTRATING!@!! We're losing so much these days... you should at least be able to enjoy a cup of freakin coffee!!!! I am really going crazy without this because I started drinking daily last year when I gave up coffee. I have lost over 40# on weight watchers and this great coffee was only 2 points great to have every morning. And here I thought I was the only one that couldn't find it. Please bring it back!!! Oh no! Is that why I can't find it. I finally was going to get on a website to see if I could purchase it in bulk somewhere. I am so sad now! I feel like a drug addict because I can't get my fix.